With so many new and emerging ways for your customers to pay for goods and services, it’s important to stay on top of the newest technology. You’ll want to make sure you choose a point-of-sale system that fits three criteria: it’s quick, it’s simple and it’s secure. 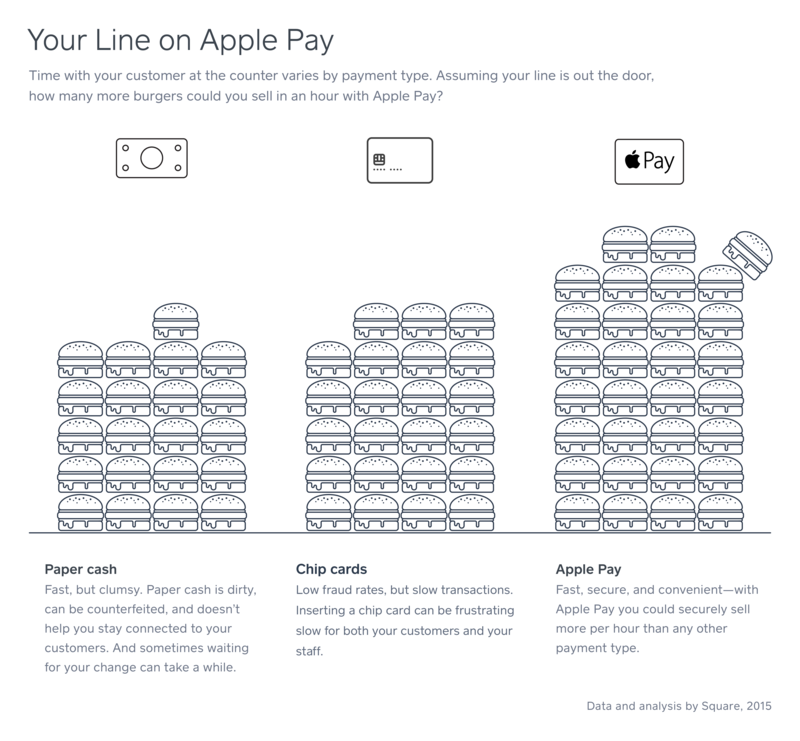 With these things in mind, you’ll probably want to start accepting Apple Pay — and let your customers know that you do. Here’s the critical information you need to know. Why should I accept Apple Pay or other types of mobile payments? The two key reasons you should be accepting Apple Pay are speed and security. Mobile payment systems like Apple Pay are super-fast to process because your customers don’t need to hand over a card or even remove their wallet — the payment is made directly from their smartphone (or Apple Watch) using NFC technology, which they probably have in their hand already. This is important, particularly for businesses that experience a lunchtime rush or have regular morning coffee queues out the door. If the line isn’t moving fast enough, customers might opt to go elsewhere. The faster you can accept payments, the more money you make for your business and the happier your customers are. How do I start accepting Apple Pay? Pick up the new Square contactless and chip reader. It’s just $59 (making it the most affordable NFC-enabled card reader in Canada). Unbox the reader and plug it into the charger. The USB cable that comes with the device can be connected to a power source. The new Square contactless and chip reader connects to your device wirelessly using Bluetooth Low Energy (BLE). Next, make sure you’re using a compatible device. Then switch on Bluetooth on your device, open the Square app and connect your reader. It takes seconds, we promise! And once it’s connected, it stays connected. Place it on your counter (we’ve even got a snazzy dock you can sit it in to keep it charged, secure and visible in your shop) and start accepting payments. When the reader is ready, one green light will appear. The customer can hold a smartphone over the reader until four green lights appear and a chime sounds. You’ll see a check mark on your screen to confirm the transaction is complete. Canadians are savvy when it comes to payments, and we adopt new technology fast. But it’s also natural to ask questions around the safety of loading your credit card onto your mobile device. Fortunately, this is an extremely secure way to pay. In order to authenticate a payment through your phone, you’ll also have to hold your finger on the Touch ID button to have your fingerprint scanned and verified. The transaction is completed in seconds, and it’s also super secure. Beyond fingerprint protection, the data associated with your credit card is tokenized and that token is always changing. So even if your phone goes missing, whoever picks it up can’t do anything with the information. How should I let customers know I’m accepting Apple Pay? Your new Square contactless and chip reader comes with a sticker in the box. Just place it in your window or near your point-of-sale terminal to let customers know you’re one of the most innovative businesses in your neighbourhood. If you misplace your sticker, don’t stress — you can always order another one by logging in to Square Dashboard.